Is there a difference between a high-end Bluetooth Headset compared to a normal one? With so many hands-free driving laws being passed these days, the question is obviously on many consumer’s minds. 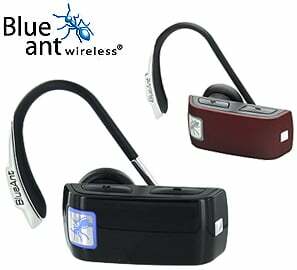 The BlueAnt Z9i ($74.95) is one of those high-end headsets that manages to combine a small and sleek form factor and with a powerful piece of technology, Digital Signal Processor (DSP). 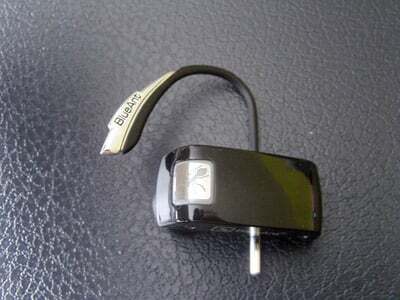 On paper, it is everything you want in a Bluetooth headset. How does it test? Does it accomplish everything it sets out to do? The Z9i’s design is extremely sleek and admirably compact. Whereas many headsets of comparable size focus on their notable lack of size over middling specs, the Z9i manages to pack strong, top-of-the-line technology in a very tight package. 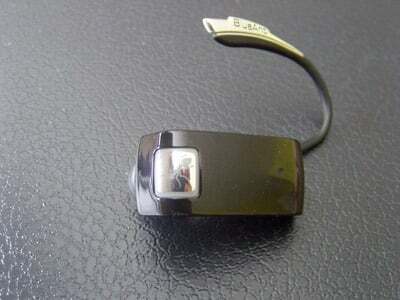 The glossy black of the body is accentuated by chrome lining—it matches incredibly well with the black iPhone 3G. 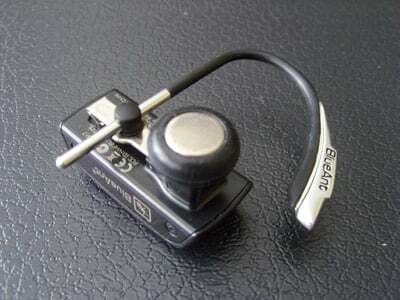 There are dedicated volume buttons on the top side of the headset and a multifunction button (power up/down, answer/end calls, and alternate between standard and max noise cancellation) on the headset’s body. Also, the Z9i includes two microphones which are dedicated to canceling noise. 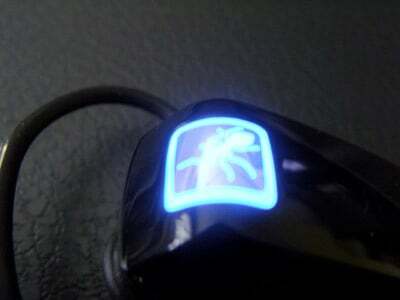 There is an obscenely bright indicator light, which flashes the BlueAnt logo in well, blue (and red). Luckily, there is an option to turn this off because it is quite blinding in a dark room. The earhook design is quite ingenious—where most other headsets have a fixed earloop or one that moves horizontally, the Z9i moves vertically. This offers easier access and greater comfort. 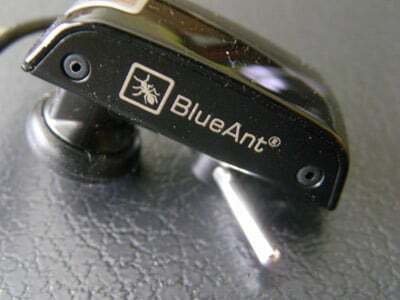 The only design quip is that one end of the earhook is strangely visible, an odd decision by the folks at BlueAnt that detracts from the overall sleekness. In all, the Z9i isn’t exactly adventurous in its design but its execution is top-notch. You would be hard pressed to find a Bluetooth headset that matches great technology with great build quality—those who enjoy a Bluetooth Headset that is small, sleek, and compact will definitely love this headset’s design. 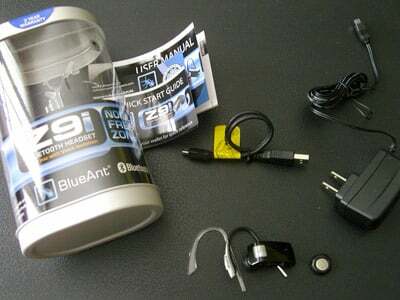 The Z9i’s packaging includes two earloops (one is transparent), two earbuds, a wall charger (MicroUSB), and a USB cable. The Z9i syncs wonderfully easy with the iPhone and as an added bonus, the Z9i is capable of being simultaneously connected to two different devices, offering seamless transition for those with multiple devices. It offers 200 hours of standby time with 5.5 hours of talk time. Taking advantage of a feature that is lacking in the iPhone, you are able to use voice commands with the headset as well. 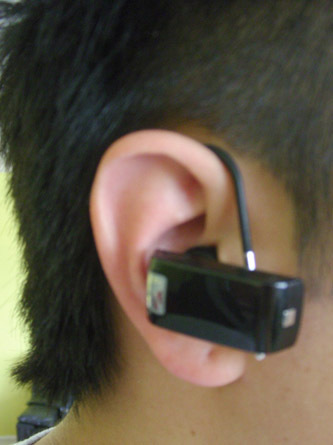 I found the Z9i to be really comfortable in the ear. 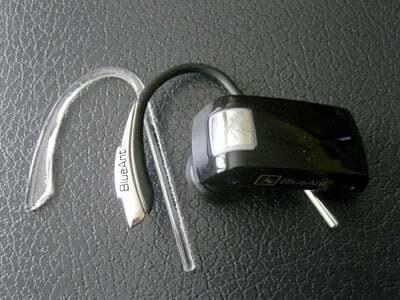 It has a basic earbud design that is really easy on the ears and plus its light weight makes it barely noticeable. In testing, I found that the incoming calls sounded great, they were clearly audible with no distortion. I had absolutely no trouble hearing the conversation and thought the Z9i was better than most in regards to incoming audio. Though it doesn’t have any technology that adjusts the incoming audio to your background, the easily accessible, dedicated volume buttons do help. In quiet situations, the outgoing audio quality is also impressive. Callers didn’t even realize I was using a Bluetooth headset and stated that I sounded perfectly normal with no digitization. The performance in quiet surroundings certainly warrants its high-end price and is impressive due to its dimunitive size. However, the noise cancellation is not as good as advertised. Though it does block out some background noise and isolates the outgoing audio, it is not the noise assassin that the Jawbone 2 is. When I had the radio on, callers could hear the song fairly clearly. This might be a philosophical difference between the Z9i vs the Jawbone 2, where the Z9i chooses to accentuate the voice of the speaker and include the background noise while the Jawbone 2 seeks to simply eliminate the background noise. Both work, but if you’re expecting Jawbone-like ability in regards to background noise, you might decide that the Z9i isn’t for you. Let it be clear, that the Z9i is better than nearly every other Bluetooth Headset available and its comfortable fit and long battery life should convince many users that the Z9i is for them. Add the bonus points for multiple device syncing, easy controls, and a small size—it clearly should be considered in every Bluetooth Headset purchase. Though it’s noise cancellation performance is not top notch, callers will definitely hear you a lot easier than other headsets. If you’re seaking a noise cancellation headset, you can do no wrong with the Jawbone 2. If you want something a little more versatile, the Z9i is a great, great headset.